Well, all you little crochetites, I’m flying to Florida tomorrow to visit relatives for Easter weekend. I didn’t think I’d get this done in time, but I couldn’t leave you without posting the pattern I promised. I haven’t gotten to pour over it as much as I’d like, so I hope there aren’t any errors. Let me know if you see anything that seems wrong. I’ll be giving it a once-over again next week when I get back. A little kitschy, I know, but fun anyway. 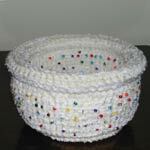 And if you’re quick, you might just be able to stitch one up, add a little handle, and have a cute, mini Easter basket. hi Donna!! i LOVE LOVE your crochet scarf over at crochetme… so awesome! and this easter basket is excellent.